Upon first seeing this strange, green lump, crawling across a rock surface on YouTube, my first instinct was that it was some strange kind of seaslug - similar to the Blue Dragon featured in an earlier creature feature. However, very quickly I found that this is actually a caterpillar with a very striking headpiece. It is the larvae of leafwing, or Nawab, butterflies. There are 400 different kinds of these dragonhead caterpillars that give rise to a wonderful variety of butterflies, all with jagged hind wings, which is a characteristic of this subfamily. Despite the butterfly being undeniably beautiful, it is their larvae that is particularly interesting and has captured the attention of thousands on social media. 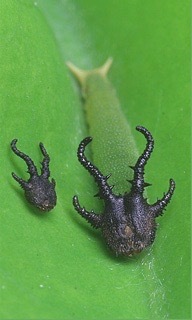 The dragonhead caterpillar has a large head capsule, with 4 curved horn-like projections, that emerge from their foreheads and are all covered in smaller spines. In particular the larvae of the Plain Nawab butterfly has a green slug-like body with a jet black head capsule, making it one of the most distinctive caterpillars of all 400 variations. It also has an interesting life-cycle. Four days after the egg has been laid, it hatches, and a 3mm long caterpillar emerges and eats the egg shell for nutrients. As caterpillars grow, they go through 5 life stages which are commonly called ‘instars.’ After each stage the caterpillar molts and slightly changes its appearance as it grows from a 3mm long larvae to a 30mm long caterpillar by its fifth, and final instar. For the Plain Nawab caterpillar, its 1st and 2nd instar head capsule is jet black and gives it quite a spooky appearance - with the head looking like an ominous black helmet against its green body. In its 3rd instar the head capsule changes to a pale yellow colour with dark-brown vertical streaks. The 4th instar sees the head changing again to a yellow-green colour with dark-green streaks. In the 5th instar the head stays the same, but by this time the caterpillar reaches its full size - about 10 times its original size. After the fifth instar, dragonhead caterpillars go into pupation, a transformative state, to become Nawab butterflies and complete their full metamorphosis. 21 year old studying Biological Sciences, Science & Tech online editor. Especially interested in anything to do with zoology or anthropology, and an aspiration to be the next David Attenborough.